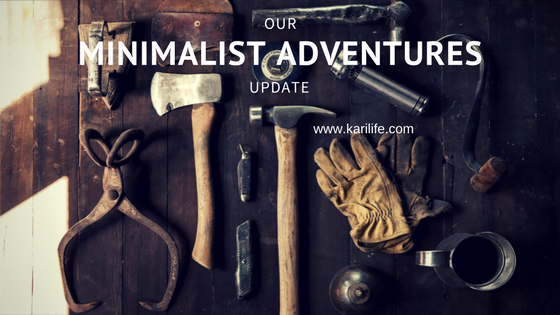 I can't believe it's been over a month since we announced our move to Missouri and our Minimalist Adventures Challenge. The great news is we were able to sell the $800 in more of our things to fund the move and some of this past month's expenses. A lot has happened since that blog post last month, and your jaw may just drop when I tell you about some of our "adventures" thus far. As you know, my husband and I accepted a church to pastor last month and made the move from Tennessee to Missouri. Our first Sunday in Missouri, we realized how much work we had in our future. The church has a parsonage (a house owned by the church that the pastor can live in). This is a huge blessing to us because it means we won't have any rent/mortgage payments and no utilities. Since the church isn't able to give us a salary currently, this helps take care of us in a big way! However, upon inspecting the house, we realized that it needed A LOT of work. The house had been sitting vacant for several months and you could tell little work had been done on it the last several years. It was in desperate need of updating as well as work on a leaky foundation and bad air conditioner. We decided to stay with my parents while we set to make the parsonage liveable. So, poised for the job and seeing what we could make it, we got to work. One blessing was that the previous pastor had left several items (mostly large furniture) and did not want them back. So, putting my minimalist adventure selling skills to use, I decided to try the minimalist challenge again and sell off the items piece by piece in order to make $1000 to put into the repairs the house needed. So, far, we've made $238 from that project (I've added another sidebar graph so you can track our progress with this). Our work was soon halted that first week as D arrived one afternoon to work and found both the parsonage and the church had been broken into. Several tools we were using for repairs were stolen as well as speakers and a DVD player from the church. We were stunned. Our family came together and patched up the broken windows and we set ourselves again to continue repairs (now with 2 windows to replace added to our list). A few days later (on a Sunday morning), D and I pulled up to the church to prepare for service and we came upon yet another break-in. Unfortunately, the burglar got away and we had another broken window to replace. On the bright side, he was unable to take anything with him this time. Again, our family and the congregation came together that morning and cleaned up the broken glass and patched up the third broken window in a week. We have dusted ourselves off again and have set off to complete the repairs. Despite the activity that first week, our tribe has really come together to get things done and we are so blessed and happy with this change. So far, we've painted a couple of rooms and have pulled up some carpet to discover hardwood floors! Yay! It's certainly been a fun adventure thus far. 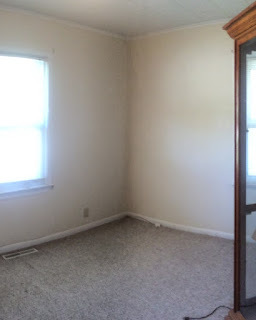 Bedroom...after I pulled up the carpet to reveal hardwood floors! 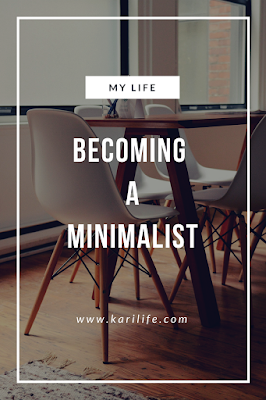 Our minimalist life is definitely at its height as we were only able to bring 2 car loads of our things. We left some items back in Tennessee that we will get later, but we're currently living VERY minimally. This will also help us determine if we really need the items we've left behind. Once we get settled in the parsonage, I'm sure I'll be able to take inventory and settle in nicely in a space sans all the stuff. So that's where we are currently. There are so many more stories to share, but it may take a few days and a few blog posts to recount them all. Suffice it to say, we're enjoying this adventure we're on and know the best is yet to come!